WINDSOR - For the first time in the program’s history, the Innovation girls basketball has a postseason victory - either conference or state. Aryanna Townsend made sure of it. With time running out, the junior hit a buzzer beater from just inside the half-court line to give the Ravens a 27-24 win over Aerospace Friday night in the CRAL semifinals. 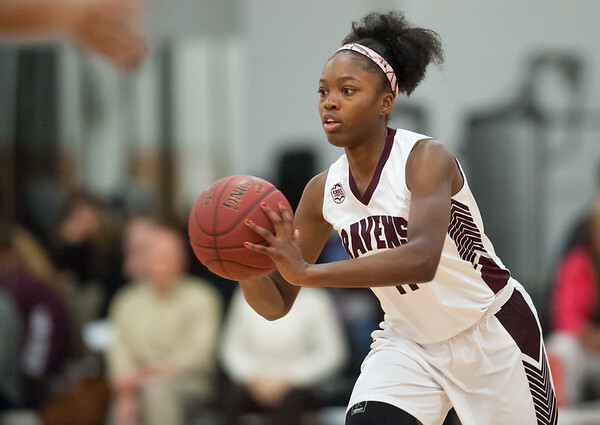 Townsend finished her night with a game-high nine points and had eight steals, four assists and three rebounds to help Innovation reach the conference championship game, which will be played Tuesday at top-seeded Parish Hill. Bailee Nardi tied the game up at 24-24 on a put back off a missed free throw from Katerina Rodriguez. Aerospace had a chance to win the game, but missed the game-winning shot with five second remaining, allowing Townsend to grab the rebound and run down the right-side of the court. Plainville 96, Northwest Catholic 74: The Blue Devils are looking to finish out their regular season on a strong note. Friday night was a good start. Posted in New Britain Herald, Innovation, New Britain, Plainville on Friday, 16 February 2018 22:25. Updated: Friday, 16 February 2018 22:27.